As I continue further on with this series of blog posts on the My Top 5 iPad Apps of the Week, which is based on my Daily #iPad App series under Twitter’s #elsuapps, I cannot help but keep thinking about the interesting posts I keep bumping into that surely reflect some more on how the iPad itself is helping shape and change drastically the computing landscape for good for us all. Specially, our new mobile computing capabilities. Earlier on this week I bumped into a couple of those articles that I thought I would share over here, as an additional and rather relevant reading for my Top 5 Picks of Week #6, which is where we are at the moment. Could you eventually go on a working vacation just with your iPad? … Apparently yes! That’s what ﻿Walt Mossberg writes on a rather interesting and delightful read under the heading “﻿An American in Paris Says Au Revoir to His Laptop” where he tells beautifully the story of a recent trip he did to Paris where he relied entirely on his iPad (And a couple of other mobile devices), with no computer, with the end result that he actually managed to get by throughout it with some really good results. Worth while a ready, for sure! 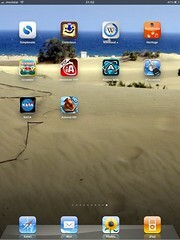 Even more so, if you would be interested in some of the recommendations he makes on iPad Apps he used during the trip. iAnnotate PDF: Without any doubt, this is the one single iPad App that handles all of those .PDF files I bump into (Whitepapers, eBooks, Proposals, Articles and whatever other kinds of publications) and which I would want to take notes of, highlight paragraphs, etc. etc. as I go along to reference them back and forth for future blog posts or cross-references. If you are into .PDF reading, this is an essential must-have application! Atomic Web Browser: If you are not into browsing the Web with the native Safari browser, Atomic Web Browser is probably one of the best alternatives available out there! I do *heart* the tab browsing capabilities and how extensive it is in general, although perhaps a tad slower than the Safari browser itself, but if you don’t really case about losing an extra second here and there, and would want to try a new surfing experience, this is the iPad app you may eventually need to try out. I think you would like it. 1Password for iPad: This is one of those applications that I love quite a bit, since I am using it on my own Mac, my iPhone and my iPad. It helps me keep my sanity with regards to the several dozens of passwords I need to manage every single day! If you have to go through that same situation 1Password is probably all you would ever need. At least, it is for me. NASA App: As usual, and every so often, I enjoy sharing over here recommendations to iPad apps that may fall a little bit outside of the working environment we are used to and enter perhaps more the fun and educational aspects of helping us learn something new. Well, in this case, for this week, that privilege is reserved to NASA’s own iPad app, which, if you are interested in the outer space and what’s happening around their various projects, it would be another one you would need to go for. The overall user experience is rather amazing and incredibly immersive! I usually “get lost” while trying to navigate and marvel myself about everything that gets shared across. So be prepared to be WOWed! Azkend HD: And, finally, like every week as well, the iPad Game of the Week.This time around coming to you from the same makers of Sparkle HD; just as good! If you are into some amazing graphics, lovely oriental music, and a long journey with quite an adventure ahead of you, Azkend HD is the game for you… For sure! And that’s it, folks, for this time around. Hope you will enjoy any of these iPad apps and don’t forget there will be more blog posts coming along for this series, since I keep bumping into some really interesting, innovative and creative iPad apps that one cannot resist but get one’s hands with each and everyone of them! Stay tuned … and till next time! Agree that the iPad is a great device when traveling. I just took my first vacation in years sans laptop, and actually found the iPad more useful than a laptop would have been. I was able to scan my work e-mail when I had a few moments using iNotes (no a long boot up! ), respond to a few important items, and create documents using Pages and MindMeister. It was also my source of reading on the plane, a place to download photos off the camera, my map, my phone on the tarmac… and Star Walk and Toy Story helped me keep my niece and nephews entertained. What’s more, the thing fits in my camera bag. I just came back from a 2 week trip to India and took my iPad. Apart from the usual uses, I also used it as backup for my photos. I took the camera connection kit dongle, the SD card version, and backed my photos to the iPad daily. It turned out I lost an SD card somewhere along the trip and I was able to get all my images from my iPad. Pretty good on-the-fly photo backup strategy. Luís, I highly suggest you take a look at the lates version of GoodReader. It now has a full set of annotation tools, in addition to the powerful reading and upload/download tools it had before. Hi Jon, well, that would depend on what you are after at this point in time. I must confess that with my recent business travelling I have been taking the iPad alone and have been managing quite nicely, without missing the MBAir a single bit. But then again I didn’t have to do any heavy computing tasks, so that helped, but depending on what you would want to do you may be able to travel light with it or not… Looking for anything in particular?